The new Kesha’s video “Your Love Is My Drug”, well, I think we waited for something better, but what I have to recognize is Kesha’s original creativity and finally not trying to copy to other female artists in the industry right now. The video is very psychodelic just a Kesha said it would be, but the best part of the video is the body-painting part, looks very interesting, is the video great? No, but it’s different, and very simple, but sometimes simple is better. So what could be expected as the third single from Kesha? 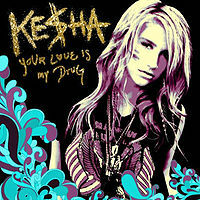 Well, apparently another of her up-tempos that were made to thunder all possible nightclubs around the world, is that unlike in the past single “Blah Blah Blah” we know from the first time we hear “Your Love Is My Drug ” will be severely more successful, even I’m sure it will be the size of “Tik Tok “. Although recently the label was a little confused in determining which would be the third single deciding between it and the wonderful” Take It Off “(And the truth is that the two are just perfect as singles), decided not nothing wrong with” Your Love Is My Drug “, simply and totally catchy, with a joyful noise contagious and before you know it, you are singing or whistling at least, yes, it is like a “drug” and insurance will be the third Kesha’s megahit if we count “Right Round”, and still we wonder, why the hell she didn’t ask for any royalties for the song!!!? ?